This post will have to be short and sweet. The challenge was essentially to make a classic puff pastry dough, bake it off into charming, flaky little cups, and then fill them with whatever our hearts desired, sweet or savory. I wasn’t too concerned about this particular challenge, having already participated in the Danish braid challenge back in June 2008, which used a slightly different method to create a laminated yeast dough. The biggest difference seemed to be that the danish dough called for beating the butter before spreading it onto the dough, while this recipe called for beating four sticks of cold butter into a uniform block. Although smacking butter with my rolling pin elicited grins from my toddler and helped me work out a little aggression, in the end it was the most difficult step in making the puff pastry dough. I got my butter block encased in dough and went through the various rolling, folding, and chilling phases, and before I knew it, I had a block of homemade puff pastry ready to shape and bake. The dough did tear and dry out a little in the process, but I forged ahead. I used two biscuit cutters to shape my vols-au-vent. They were a little too close together in size and their edges weren’t as sharp as I would have liked, but beggars can’t be choosers, and they did the trick nonetheless. I used just a third of my dough, and produced enough shapes for 5 vols-au-vent and their little caps. One had to be Frankensteined together from the scraps, so it came out pretty flat and on the ugly side, but I gave that one to the baby, and he didn’t seem to care. 🙂 All told they puffed up alright as they baked (I think they just about tripled in height), but seemed to lose a lot of butter in the process, and I think my dull cutters crimped their edges a bit. I gave Jeremy a choice of fillings between chicken dijon stew and a riff off of eggs florentine, and he immediately chose the latter—possibly because I just made chicken pot pies last week (post to come, hopefully). So I made a simple mornay sauce of gruyere and parmesan, sauteed some onions and spinach, and scrambled a few eggs. My vols-au-vent were on the small side so they couldn’t hold much filling, but two of them were nevertheless plenty for dinner, and very tasty. I’ve still got two-thirds of my puff pastry dough in the fridge, and, thanks to my fellow Daring Bakers, infinite possibilities of what to use it for. A sweet variation is definitely in our future. 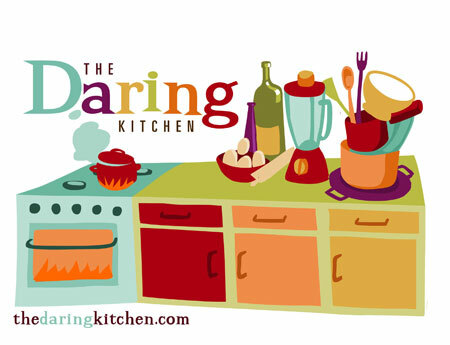 Thanks so much to Steph for choosing the challenge, and please check out all the daring pastries at the Daring Bakers Blogroll. Put the all-purpose flour, cake flour, and salt in the work bowl of a food processor fitted with a metal blade and pulse a couple of times just to mix. Add the water all at once, pulsing until the dough forms a ball on the blade. The dough will be very moist and pliable and will hold together when squeezed between your fingers. (Actually, it will feel like Play-Doh.) Remove the dough from the machine, form it into a ball, with a small sharp knife, slash the top in a tic-tac-toe pattern. Wrap the dough in a damp towel and refrigerate for about 5 minutes. Unwrap the dough and place it on a work surface dusted with all-purpose flour (A cool piece of marble is the ideal surface for puff pastry) with your rolling pin (preferably a French rolling pin without handles), press on the dough to flatten it and then roll it into a 10″ square. Keep the top and bottom of the dough well floured to prevent sticking and lift the dough and move it around frequently. Starting from the center of the square, roll out over each corner to create a thick center pad with “ears,” or flaps. 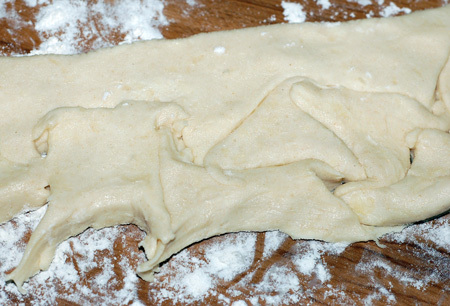 Many puff pastry recipes use a teaspoon or two of white vinegar or lemon juice, added to the ice water, in the détrempe dough. This adds acidity, which relaxes the gluten in the dough by breaking down the proteins, making rolling easier. Keep things cool by using the refrigerator as your friend! If you see any butter starting to leak through the dough during the turning process, rub a little flour on the exposed dough and chill straight away. Although you should certainly chill the dough for 30 to 60 minutes between each set of two turns, if you feel the dough getting to soft or hard to work with at any point, pop in the fridge for a rest. Not to sound contradictory, but if you chill your paton longer than the recommended time between turns, the butter can firm up too much. If this seems to be the case, I advise letting it sit at room temperature for 5-10 minutes to give it a chance to soften before proceeding to roll. You don’t want the hard butter to separate into chunks or break through the dough…you want it to roll evenly, in a continuous layer. Roll the puff pastry gently but firmly, and don’t roll your pin over the edges, which will prevent them from rising properly. Don’t roll your puff thinner than about 1/8 to 1/4-inch (3-6 mm) thick, or you will not get the rise you are looking for. Try to keep “neat” edges and corners during the rolling and turning process, so the layers are properly aligned. Give the edges of the paton a scooch with your rolling pin or a bench scraper to keep straight edges and 90-degree corners. Brush off excess flour before turning dough and after rolling. Make clean cuts. Don’t drag your knife through the puff or twist your cutters too much, which can inhibit rise. 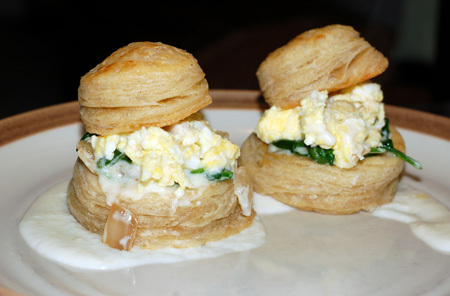 When egg washing puff pastry, try not to let extra egg wash drip down the cut edges, which can also inhibit rise. 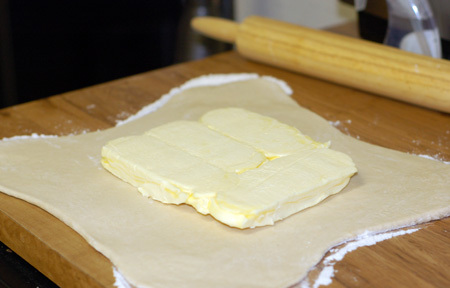 Extra puff pastry dough freezes beautifully. It’s best to roll it into a sheet about 1/8 to 1/4-inch thick (similar to store-bought puff) and freeze firm on a lined baking sheet. Then you can easily wrap the sheet in plastic, then foil (and if you have a sealable plastic bag big enough, place the wrapped dough inside) and return to the freezer for up to a few months. Defrost in the refrigerator when ready to use. You can also freeze well-wrapped, unbaked cut and shaped puff pastry (i.e., unbaked vols-au-vent shells). Bake from frozen, without thawing first. Homemade puff pastry is precious stuff, so save any clean scraps. Stack or overlap them, rather than balling them up, to help keep the integrity of the layers. Then give them a singe “turn” and gently re-roll. Scrap puff can be used for applications where a super-high rise is not necessary (such as palmiers, cheese straws, napoleons, or even the bottom bases for your vols-au-vent). Those look fabulous. Great job! I love the breakfast idea. and your pastry looks great.